If you have been following our blog, you know that we normally cover the latest trends in cybersecurity, discuss data breaches, and explain about compliance issues. This time, I wrote a blog post that is different from my usual ones. cited in this year’s report. To quote: “Cymulate offers immediate benefits by automating the process. Having access to more near-real-time security status is an important attribute for security programs, because the threat landscape is changing faster than the standard interval used with penetration and more traditional red team exercises”. assessment (CARTA) strategic approach, which is an increase from fewer than 5% in 2017.” Being named a ‘Cool Vendor’ validates our mission to improve the way companies test their security posture and verify their resiliency to cyberattacks at any time, from anywhere. It shows that our Breach & Attack Simulation Platform not only meets the needs of our customers, but even exceeds their expectations. 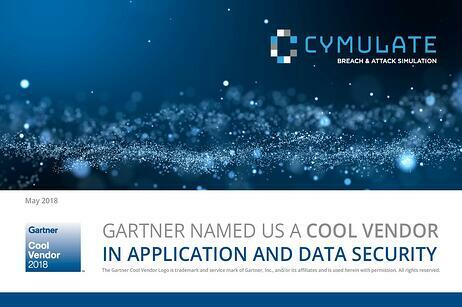 So what’s “cool” about Cymulate as a vendor? Well, we believe that we are a Cool Vendor since we identified a gap in the market and provide a solution that meets that need. To specify, we enable any organization, regardless of its size or industry, to assess its security posture at any time from an attacker’s perspective regardless if such an attacker is a common cybercriminal, a malicious hacker or a professional cybercrook. Best of all, it is done in a very simple way without requiring the organization to allocate extensive resources in time, money or manpower. Our automated BAS platform enables business and IT personnel to find out if their current security framework is vulnerable for a number of attack vectors that are used daily by attackers. These vectors relate to email, browsing, phishing, lateral movement, endpoint compromise, and data exfiltration. We also provide intelligence capabilities which inform our customers about zero-day attacks as well as the latest cyberattacks which are out in the wild. The assessments correlate different payloads and attack techniques across multiple parameters in real time to alert the organization regarding its exposure and resiliency level to cyberattacks. Furthermore, suggestions are made regarding what action is needed to mitigate found exposures. Read the full report “Cool Vendors in Application and Data Security, 2018,” authored by Ayal Tirosh, Neil MacDonald, Jeremy D’Hoinne, Dale Gardner, Pete Shoard and Tricia Phillips, 04 May 2018 (requires Gartner subscription).